In addition to storytelling, Elizabeth has been involved in numerous theatrical ventures. She is a 20 year member of the professional playback theater group, The Heartsparkle Players, which every month, (every second Friday Oct-May) performs at Traditions Cafe in downtown Olympia WA, In addition they teach workshops and conduct as commissioned performances for specific organizations. Playback Theater is a form of improvisation where members of the audience tell a true story or brief moment from their life, and the actors and musician re-create it on stage, thus: play it back. Playback theater is an art form that elevates and amplifies the everyday human experience, and transforms it into a piece of living, breathing, moving, art. She has done numerous shows over the years, both directing and acting, with now sadly defunct Prodigal Sun Productions (2001-2014), the former steward of the Midnight Sun Performance Space in downtown Olympia. That space is now operated by Theater Artist Olympia, another organization Elizabeth has worked with. 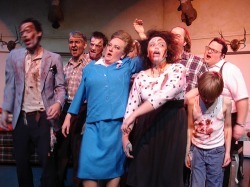 One show was The Night of the Living Dead, The Musical (pictured above) The last performance she did with TAO was the part of Lecturer in the December 2008 production of Reefer Madness the Musical. She was the assistant director for Olympia Family Theater's You're a Good Man Charlie Brown, and of course her legendary performance in Parallel Lives produced by Prodigal Sun Productions in 2011. She is the Director of the performing arts organization BigShowCity which supports local burgeoning artists both financially and emotionally and helps them to produce new work. BigShowCity produces an annual Vaudeville show which serves as it's primary fundraiser. In February of 2010 she directed the drama Stop Kiss by Diana Son for Prodigal Sun Productions. She performed in Prodigal's insane comedy Crazy and a Half by D.R. Anderson. Read more about the show and Elizabeth here. The last stage play Elizabeth acted in was Parallel Lives in February 2011, and two small roles in the Improbable Peck of Plays (IPOP) for Prodigal Sun in Fall of 2012. She directed two One-Act plays for IPOP III (a TAO production) in August 2014. She recently directed a play for Tales Told in Ten at Olympia Family Theater 2018.